Bold links jump down to sections on this page; text links go to my pages on other sites. I was born in Waterbury, Connecticut in 1957, and grew up with a 4 year older sister and later an 8 year younger brother. I attended our neighborhood elementary school K-7. In 1967-68 (6th grade) we moved to Berkeley, California for a year while my father, who had been practicing law for more than a decade, completed a Ph.D. in urban planning. We lived just a few blocks from People's Park in that climactic year of the student movement, so I got to experience national guard troops with flowers in their bayonets up close. I started high school back in Waterbury during should have been my 8th grade year because I was getting into trouble in elementary school (probably bored and not challenged enough). After graduating from high school in 1974 I went to college at Wesleyan, a small liberal arts school about 30 miles from Waterbury in Middletown, Connecticut--close enough to bike home whenever I wanted, but far enough to be out of range of parental scrutiny. I worked as a baker at the school dining hall, then as a tutor in self-paced calculus and a grader in introductory physics. I was also a computer operater (on an old DEC-10 mainframe). In the summer after my junior year I was a teaching apprentice in physics at St. Paul's School in Concord, New Hampshire. In college I continued my high school sports, running cross country for 4 more years, but swimming only during my freshman year. In both I did distance, running consistent 5-minute miles (my track best was 4:54 I think, and I broke 11:00 in the 2-mile. I swam the 400yd. and 800yd. in about 5 and 11 minutes as well. But bicycle touring was really my passion. My first real bike trip was in Italy in January 1974, then Nova Scotia and Newfoundland in the summer of 1976, and Europe (Amsterdam to Nuremberg) in summer 1977. I crisscrossed New England and Germany many times as well, especially while spending my senior college year (1977-78) abroad in Freiburg, in Germany's Black Forest, where I joined a local cycling club. 1977 was a watershed year for me for another reason as well: in May I participated in the occupation of the Seabrook, N.H. nuclear power plant construction site, organized by the Clamshell alliance. 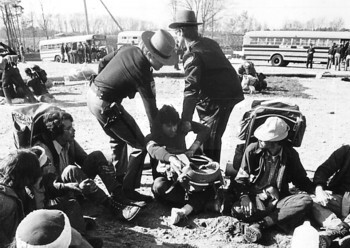 1414 people, including me, were arrested that during that occupation. 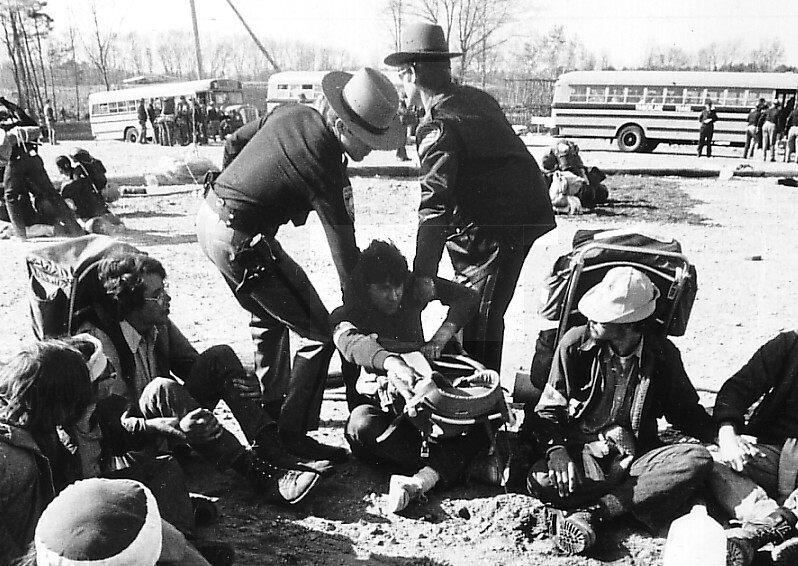 The picture of my affinity group, at right, shows me being dragged away by state police. In my following year at the University of Freiburg I enjoyed art history tremendously (thanks to Augustiner-Museum curator Dietmar Lüdtke), and decided to return to Germany to study it, which I did in 1979. I completed my BA-level qualifying exams (Zwischenprüfungen) in Freiburg in 1982, then transferred to the University of Munich, where I planned to get my MA. While there I decided that I wanted to do my M.A. thesis on a more contemporary topic (post-World War II monuments and memorials), which was frowned upon in the rather conservative art history department there. After having received a warm welcome at the University of Hamburg during a student conference, I transferred there in after only a year in Munich. In 1985 I co-produced a traveling photographic exhibition about World-War-II-era memorials (Steine des Anstosses), then completed my MA in 1986, the same year I entered a PhD program in history at the University of Michigan, back in the US. I married in 1987, separated in 2001 and divorced in 2010. My son Aaron was born in Ann Arbor in 1988, and we returned to Germany for a 2-year stint of PhD research that same year. Thus we were in Hamburg when the Berlin wall was breached in November 1989. I finished my PhD in 1992, and was hired that year by the history department at the University of California, Santa Barbara, where I teach courses on world history since 1700, and German history since 1800. 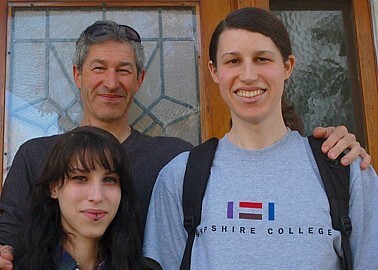 My daughter Miriam was born in Santa Barbara in 1993. I married a second time in 2012. One of my interests is history education and public exposure to history (monuments, museums, school curricula, films, ...), so I was involved in the reform of UCSB's General Education requirements for many years (1997-2004). (See my UCSB GE homepage.) I am also concerned about the effects of the No Child Left Behind Act on our school, and as a representative on the local elementary school site council collected data on my IV NCLB page. with a page on installing a Bike Rack on a Prius. I guess my Seabrook nuclear plant occupation page (1977-present) would count in this category as well.